Willie (William) Wilkinson had been breeding Korats for many years under his “Theoaks” prefix. His love of both horses and Korats led to many awards. Sadly, William had motor neurone disease which had been diagnosed a few years ago and, despite a brave battle, he died on 14th February 2016. 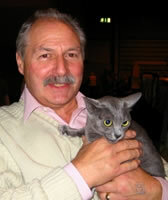 He was very committed to the Korat breed, and his legacy remains in the form of many Imperial Grand Champion Korats, including UK Grands. My thoughts and condolences are with Willie’s many friends and family at this sad time.